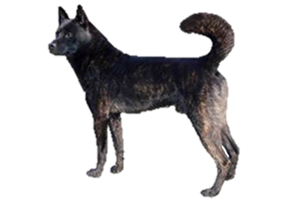 The Kai Ken is one of six native Japanese dogs that in Japan are classified by size because they are so similar in type. The Akita Inu is the only large breed and the Shiba Inu the small. The last four are medium, Kai Ken, Hokkaido Inu, Kishu Ken, and Shikoku Inu. The Kai Ken is named for the mountainous Kai district in the Yamanashi Prefecture. The Kai Ken is known for its distinctive brindled coat. In Japanese it is called torage or ‘tiger fur’. This gives the alternate name of Tora Inu (Tiger Dog). A hunting breed, the Kai Ken was originally developed for large game such as deer and boar. Traditionally they hunted in packs and were separated into two categories, wild boar Kai and deer Kai. The Kai Ken has existed in the Yamanashi Prefecture since medieval times. Kai is an isolated area geographically, leaving their dogs undiluted from European influences. Therefore, it is believed that the Kai Ken is purest of all the native Japanese dogs. The breed was almost extinct after WWI and it took a specialized program to revive it in the 1930s. Despite being declared a Natural Monument in 1934 the Kai Ken remains a rare today. Is the Kai Ken Right for You?